Union activists say that a police raid on a 72-year old trade unionist in poor health today is part of a crackdown on all political activists. This afternoon at 2pm, eight police cars raided the Orakei house of Jimmy O'Dea, a 72-year-old trade unionist in poor health. The house was searched under a warrant mentioning a kidnapping in the area. Jimmy O'Dea says that when he told the police he was too old to be involved in any such thing, the police replied: "No you're not." "Jimmy O'Dea has been a fighter for both Maori and trade union rights for decades now," said Joe Carolan, secretary of Solidarity Union. "Jimmy helped to organise trade union support for the Bastion Point occupation in 1978. "Despite his poor health, he's been helping organise the new Solidarity union among industrial workers in South Auckland. "To anyone who knows Jimmy, the idea that he could be involved in a kidnapping is purely ridiculous," said Joe Carolan. "But what is true is that Jimmy is known as a fighter for workers' rights and Maori rights. The police know him as a 'troublemaker' from way back. "If this is a coincidence, it's a very peculiar one," said Carolan. "We have been saying that the "anti-terror" raids of last week are an attempt to strike fear in the heart of all political activists. "This raid on a 72-year old man in poor health just confirms what we've been saying." 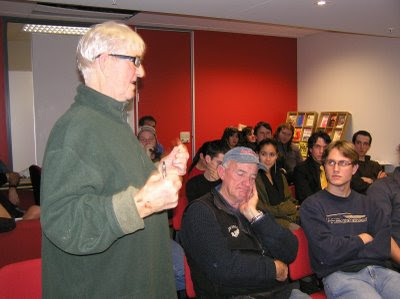 New Zeal Jimmy O'Dea is a longtime member of Socialist Worker and before that was a leading Communist Party activist. Check out his profile here. Check out his involvement with Bastion Point here. By all accounts O'Dea he is a lovely old chap-but he does have a callous streak. O'Dea has also been a long time supporter of the Irish Republican Army's armed struggle for a socialist Ireland. In a June 1971 was Secretary of the Irish Connelly Association in Auckland. When interviewed by Truth newspaper, O'Dea defended his organisation's financial support of the Irish Republican cause. "Of course we send them funds for arms. What else?... We think the only way to get united Ireland is by violence... A few people on both sides are killed, but what is this compared to the thousands who die through starvation over the years? You've got to put these things in perspective. The cause justifies the casualties." Nice people can be fanatics too, you know. Poor old Jimmy O'Dea he did not deserve that. Get a life Trev ... in your eyes everyone is a commo .... how do you sleep at night Trev? There is medication available for this kind of paranoia. Have you checked out www.surviveclub.org.nz ? They all wear camo stuff from the Warehouse .. check out the pics Trev. Or are you a member too?!? Their camp is somewhere near where you live. Why aren't the cops investigating them? The armed resistance to the brutal british occupation in the 6 Counties is justified by the very presence and nature of the british military alone. sine e says "The armed resistance to the brutal british occupation..."
I thought that Israel had a monopoly on brutal occupations. Now we are informed that New Zealand is a brutal occupying power. Next will come demands for the 'right of return' of all of NZ. Then the UN will start issuing strongly worded condemnations if you don't capitulate. Sounds like NZ has a "Palestinian" problem. Huhana, your comments are appauling. Do you not at least care that O'Dea is a supporter of the Irish Republican Army or with the IRA's close association with totalitarian state of Communist Cuba and the Palestinian Liberation Organization (PLO)? What part of my comment is "appauling"? Do you know Jimmy O'Dea ....do you know any tangatawhenua? Have you been to Aotearoa?